6 Cell Clamshell holds 2.75 oz. of wax, and is the most common size in the market. Our clamshells work well with high fragrance loads and pour temps up to 150°. They snap shut and are easy to open. Maximum Label Area Size Is 2-1/2" Wide x 3-3/8" Tall. PET material won't interact with fragrance or dyes.These wax melt clamshells are sturdy, with a tight seal to ensure candles stay fresh. Avoid Messy "Blow Outs" As These Wax Melt Molds Feature A Robust Cell Wall Thickness of 0.5 mm. 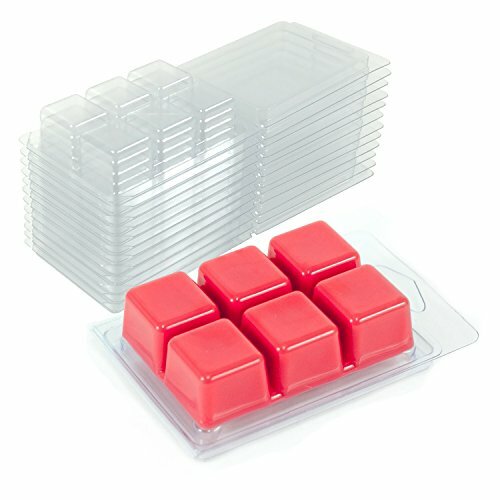 Perfect for all types of wax or soap,the wax pour temperature for these wax molds is up to 150 Degrees F.
Pack of 100pcs.Work perfectly with labels size 2 1/3" x 3 3/8". 100% quality guarranty by DGQ brand from Leateck. If you have any questions about this product by DGQ, contact us by completing and submitting the form below. If you are looking for a specif part number, please include it with your message.